This post is part of a series. To read it in its entirety, click here. Speaking about things that people feel devalue their life, it’s time to talk about number six on our list…Ads. First, there’s the site itself. It costs more money than the GDP of several small nations to operate a website that manages millions (and sometimes billions) of data streams in a single day. 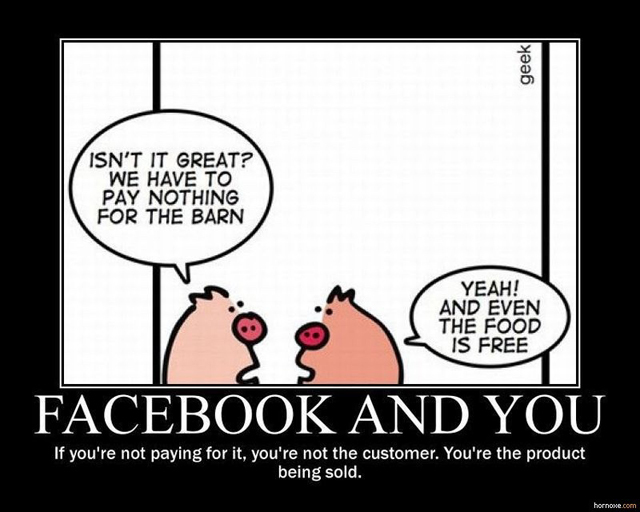 We all like to think that we somehow own Facebook, but the reality is if you’re not paying for it you’re not the customer, you’re the product. We all have our favorite social media sites, and if they went away tomorrow we’d be very sad. It’s my opinion that most of these sites (almost all of them) are working hard to keep the value of the experience high, while also trying to make a buck, simply so they can stay in business. I’m thankful they did not fully adopt the television model whereby completely interrupting my entertainment for the sake of keeping the lights on. True, most social sites have ads that they put right in there with the rest of the content and it can sometimes be a little disappointing. Many blogs and news sources do this too, but nobody’s complaining about that. Also, it’s a fact that they use your own data against you. When you created that profile and gave them gobs of information about your personal interests, you were also empowering them to let advertisers target you so you could be manipulated into buying crap you actually might buy (imagine that). In the grand scheme of things, ads are not all that bad on the social sphere. When they get worse (and they will), the end user has the luxury of skipping down the virtual street and joining another social network for their enjoyment. This is good for users and keeps the folks who run the website in check. Now, let’s look at it from the perspective of the ad buyer, brand or marketer. Ads, throughout history have been a sowing and not a reaping activity. If you want to measure the effectiveness of your social media advertising, measure exposure…measure quality of the targeting. If you’re spending money on Social Media ads and you’re not directing traffic to a website that is designed to convert traffic to sales or leads, then it’s not your advertising you should be blaming and you shouldn’t talk about ROI like you know anything about it. I’ll say it again; it’s a sowing activity! What does that mean? Ads, in and of themselves (all marketing, really), are designed to spread the word (read: plant seeds), not to harvest a crop. If you paid laborers to plant apple trees, but you let the ripe fruit fall to the ground and die, you can’t blame the laborers who planted the trees for your bad harvest. If you’re going to advertise anywhere, get an education first. Social media sites are an awesome place to advertise. Not only do I not mind the occasional ad showing up in my news feed, it’s usually targeted to my specific interest. Do I click on them? Hardly ever, but that’s also the beauty of it. Depending on how much you spend, you could target thousands of “me.” And if “I” click an ad once in 10,000 times, but you show the ad to 10o,000′s of “me”…well, then, that sounds like a pretty good opportunity for just about any business person. Done right, they can be a very useful tool for getting the message of your products, services and brand out there. They’re cheap, in comparison, and the targeting is fantastic! For social networking sites, and apps, they are a good source of revenue. For the members of the sites, they keep the home page free, the profile descriptive, the search engine running, the messages private and the notifications coming. This entry was posted in Social Media and tagged advertising, marketing, social. Bookmark the permalink.